The August Sale! | Damian Trasler's Secret Blog - Do Not Read! But don’t just take my word for it – check out the links below to go straight to your nearest Amazon Website and see for yourself! The true-life story of how my family and I emigrated to Canada, and how we got on in the first year of our new life. With Pictures! Three stories from the male perspective, with three men in different, but desperate circumstances. Also the opening of my upcoming Zombie novel. Four stories of Science Fiction and Fantasy. Five short stories, originally written for women’s coffee-break fiction magazines. These are not grim and gritty stories of the real world, nor are they faerie, werewolf or sparkly vampire-filled stories of a underworld, netherworld, netherparts or underwear. They are gentle, uplifting and feature female protagonists and romantic storylines. Like all writers, a sale of a book is the best birthday present I could get. And if you’ve already bought one of my books, why not consider leaving a review on Amazon or Goodreads? Honesty is encouraged, because when you review it’s YOUR reputation on the line as much as mine – you want your friends to trust your judgement, don’t you? To all other August birthday folks (like fellow author but sadly dead person Mary Shelley) have a HAPPY BIRTHDAY! 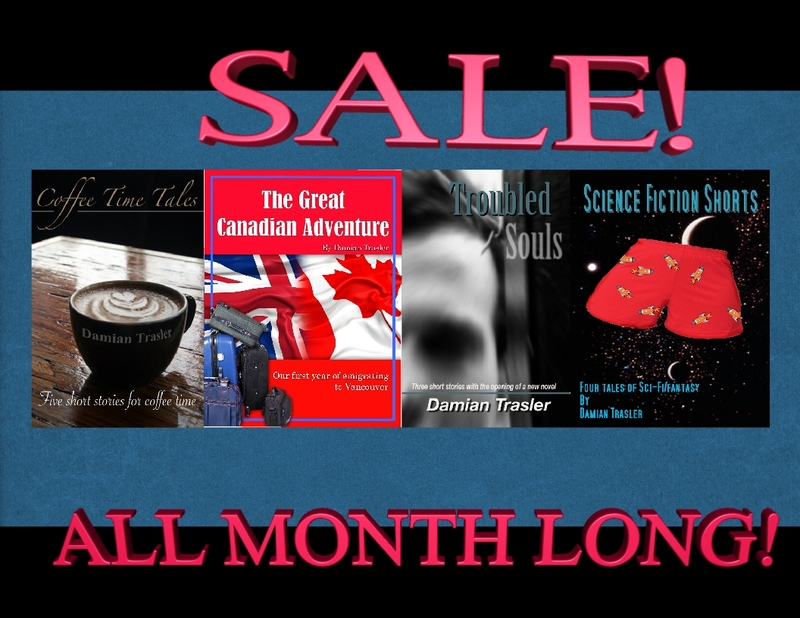 This entry was posted in Writing and tagged august sale, book sale, Books, buy a book, cheap books, Damian Trasler, ebooks. Bookmark the permalink. “These are not grim and gritty stories of the real world, nor are they faerie, werewolf or sparkly vampire-filled stories of a underworld, netherworld, netherparts or underwear.” Hilarious! I found you through the comments on Kristen Lamb’s blog – glad to see there’s someone else out there who writes both books and scripts! Thanks Sinistra! I’m trying to deliberately write a book this time, rather than accidentally make one up out of shorts or blog posts. Writing scripts is easier, I think.